Japan, S. Korea and Taiwan share 58% of semiconductor wafer capacity in year 2012 as per latest study by semiconductor market analyst IC Insights, you can relate this to another finding by IC Insights where the memory ICs and semiconductor foundries accounted for a combined 54% of the IC industry’s installed monthly capacity of 14,497K wafers (200mm-equivalent wafers) . Logic represented 12.4%, Microcomponents (MPU, MCU, DSP) represented 10.3%, and Analog devices accounted for 9.6% of capacity. The “other” segment is comprised mainly of capacity used in the fabrication of optoelectronic, sensor, and discrete (O-S-D) devices as well as some R&D functions in fabs that are otherwise used primarily for the volume production of IC products. Large-scale production of DRAM and flash memory helped drive installed capacity for all memory to 36.1% of installed capacity in December 2012, while the growing foundry segment represented 27.5% of capacity. In terms of sales, virtually all pure-play foundry business is in the fabrication of logic and mixed-signal ICs. 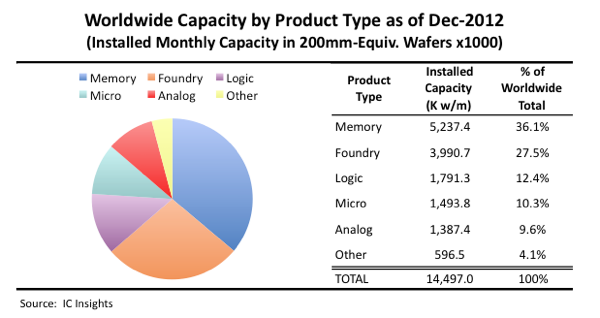 Memory product wafers accounted for only about 1% of total pure-play foundry sales in 2012. Figure below shows that on a regional basis, capacity for analog products is fairly evenly distributed among Japan, Europe, and the Americas regions. In memory, capacity is held mainly by South Korea, Taiwan, and Japan. The largest portion of logic capacity is located in Japan, with the Americas, South Korea, and Europe holding smaller, but still sizeable, shares. The Americas region is tops in microcomponent capacity due mostly to high-volume MPU production from Intel. In foundry, Taiwan is by far the largest shareholder of capacity having about 48% of the world’s capacity dedicated of foundry work. China also has a large amount of foundry capacity, with SMIC being responsible for most of that.